Since the mid of last December, when the first big leg lower in Bitcoin was executed, trading in cryptocurrencies tumbled significantly on the back flurry of negative news such as, google banning its ads from June, New York cryptocurrency companies to be charged with higher electricity rates, Canadian regulatory issues investor warning against Bitcoin-bank.io, Indian Finance ministry has come up with a bill announcing to ban Ponzi schemes in unknown cryptos and not allowing legal tender. On the flip side, very recently, online brokerage IG group on Thursday reported its results for Q3 of fiscal 2018 that ended on the 28th of February. The company has printed a record quarter as cryptocurrency trading contributed to a sharp 30% surge in revenues to GBP 152.9 million ($216.7 million). The figure was also higher by 13% when compared to the previous quarter, sources report. Crypto startup Coinbase receives e-money license from UK FCA. While Dorsey the CEO of twitter told that the world ultimately will have a single currency, the internet will have a single currency, “I personally believe that it will be Bitcoin”, sources say. Amid all these turbulence, Crypto trading appears to be highly subtle to price levels as traders are looking to enter the market primarily when prices are going up. 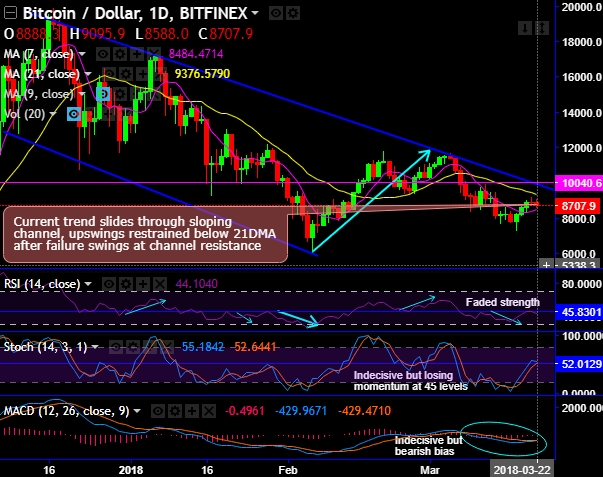 Technically, the current trend of BTCUSD slides through sloping channel pattern which is bearish in nature, the attempts of upswings are restrained below 21DMAs on daily plotting after the failure swings observed exactly at channel resistance. Dragonfly doji occurs at 8069.3, consequently, the current prices spike above 21EMAs, shooting star counter-rallies to plummet prices below EMAs again, while both leading & lagging indicators signal more bearish swings to come in the near future. Although the bulls attempt to spike this week, momentum is in bears favor. Hence, trade in spot BTC by going long for the targets upto $9177 levels, while as shown in the diagram, we recommend adding longs in 1m pure ATM -0.42 delta puts on hedging grounds. This position likely to arrest any further potential price dips in the near term.